you don't have a good pie, so it's a pretty weak fall (Henz). 2. Whisk eggs in a bowl until thoroughly whisked and a little foamy. 3. 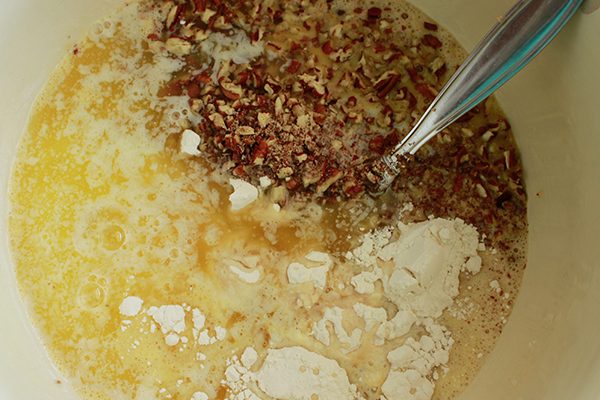 Mix in brown sugar, butter, sugar, chopped pecans, flour, milk, and bourbon. 4. 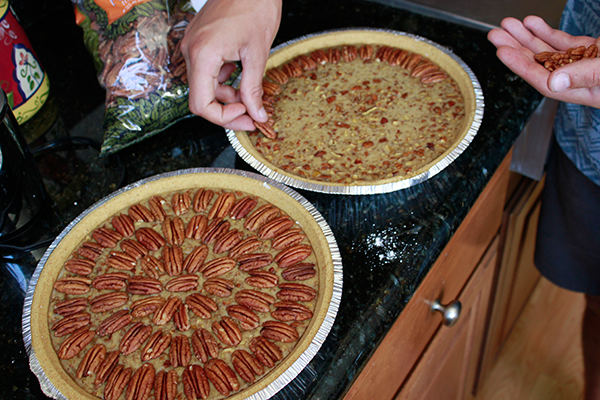 Once mixed, pour mixture into pie crusts and top with pecan halves. 5. Bake pies at 325 for 25 minutes (this may depend on the oven, but maybe it's better to under-cook here just a little than over-cook). Then turn temperature down to 300 and bake for another 25-30 minutes. 6. Let pies sit in oven once baking is done for around 3 hours. Then take out, slice up, and enjoy. * There are lots of pecan pie recipes around, and we have made quite a few. Most use corn syrup, some use molasses. This is our current favorite, based on Southern Living's "Utterly Deadly Southern Pecan Pie".